After the third volume of Sweep, the entire series seemed to just go down the drain. You know...? The fourth volume was okay. But it wasn’t ANYTHING like the last three. I’m keeping his nice, short, and simple because I don’t want to put things down that I think happened and they didn’t. Hunter’s POV as he ties up a lot of loose ends on his part. See, he and Morgan want to consummate their love, and they can’t, because he’s leaving for Canada, and wah wah he doesn’t want it to be during a goodbye lalala. Another woman starts hitting on him in Canada and she kisses him and Morgan just HAPPENS to be scrying at that point...yeah, too coincidental. I’m starting to hate coincidence in books. Hunter comes back and he feels nothing will ever be the same between Morgan and him waaah even though everything is fine especially since he found (insert spoiler) and a journal from Morgan’s ancestor, the creator of the first dark wave. I REALLY did not like Seeker. It was boring, not engaging at all, and kind of irritated me for the most part. Especially with (insert spoiler here). The journal that I just mentioned. Going back in time like this was a big switch. ...I’m thinking about this now. Okay. Imagine you’re being prejudiced and you meet with this person who would also like to prejudice against you, but you INSTANTLY fall in love with him. Yeah, love at first sight, muirn beatha dan, whatever. But you FREAKING HEX HIM to make him fall in love with you. No problem with that, right? Yeah, wrong! The first three fourths of the book is about Rose drooling over Diarmuid and being persecuted and suspected, etc etc. Finally Diarmuid breaks the hex that’s making him love her, casts her out, and then she’s imprisoned and about to be executed. This was the only interesting part of the book to me, where she actually created the dark wave. Her emotions boiling forth into this mass that wanted to destroy everything, and its outcome. So, Origins was better than Seeker. But not by much. I don’t like Alisa. And part of the book is told from her point of view. It drives me insane. She annoys me and she’s whiny... When it WASN’T from Alisa’s point of view, the book was fantastic. Maybe this is all just because I prefer Morgan so much more compared to everyone else. She’s my favorite character (aside from maybe Ciaran. He’s awesome). So basically this is all about the remnants of Amaranth as well as Ciaran bringing forth a dark wave to destroy the Widow’s Vale, but Morgan still loves her dad, and there’s tension there because (crap, another spoiler). So she’s struggling with several internal things as well as external, and there’s still a buuunch of lust involved between her and Hunter, and the story progresses. Eventually it comes to the climax when Alisa is the one who has to save the day because she’s half-witch, which she doesn’t want to believe but finally accepts when she’s the only one not half-dead due to the dark wave toxins. Okay, cool. The end of this book was actually really neat. In conclusion, this volume was only exciting around the end of each book, at their climaxes. Otherwise they were very boring and not that engaging. Maybe I’m being a bit too fussy over this, but that’s how I felt. :/ TRUST ME when I say this volume is important to the series that is Sweep, but I feel like it could’ve been handled ALL in one short 200 page book. Not 560. 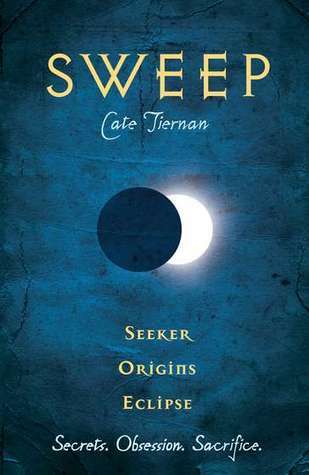 Cate Tiernan’s writing is still fantastic, but the content was subpar.